Posted in: Journal Club. Tagged: exoplanets, Kepler mission, metallicity. 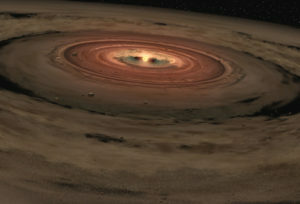 Artist’s conception of a protoplanetary disk from which planets form. During today’s research group meeting, we discussed a paper from a few years ago from Lars Buchhave and colleagues that investigated the relationship between the composition of a planet-hosting star and the properties of its planets. The discoveries of thousands of exoplanetary systems in the last few decades has revealed the bewildering variety of planets formed in our galaxy, and the richness of this planetary zoo probably reflects the wide range of conditions in which these planets formed. Going back to the philosopher Kant, planets have been thought to form in disks of gas and dust leftover after their host star forms, and we now have a plethora of observational and theoretical evidence supporting this idea. This idea means that the star and planets form mostly from the same source of material. However, while stars form directly out of the disk, the formation process for planets is a little pickier about what goes into the planets. For example, the Sun is made almost entirely out of hydrogen and helium, elements that constitute most of the baryonic matter in the universe, while the Earth is made mostly of rocky elements, which are pretty rare in the universe. The gas giant Jupiter is kind of a mix – it’s mostly hydrogen and helium like the Sun, but it has more of the heavier elements than the Sun, all of which astronomers refer to as metals. In their paper, Bucchave and colleagues report estimates of the ‘metallicities‘ or the amount of metals in lots of planet-hosting stars and try to figure if the type of planets around a star depends somehow on stellar metallicity. Figure 1 from Bucchave et al. 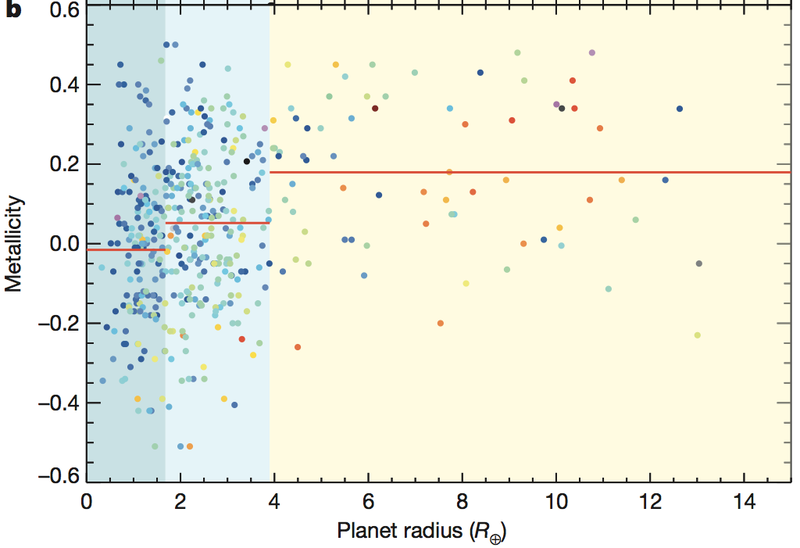 (2014) shows the metallicities of stars vs. the radii (in Earth radii) of their planets. The horizontal red lines show the average metallicity for stars in that group. Interestingly, the metallicities suggests there are three kinds of planetary systems – shown as dark blue, light blue, and yellow in the figure above. Big gaseous planets like Jupiter, with radii many times Earth’s, seem to form preferentially around stars with lots of metals, while small planets like the Earth aren’t as picky – they’ll form around stars with any metallicity. And planets with radii in between, about 2 to 4 times the Earth’s radius, they’re like Goldilocks and prefer stars with a little more metals but not too much. What does all this mean? Astronomers think the protoplanetary disk (and therefore the star) might be required to have lots of planet-forming materials (that is, metals) in order to make big planets like Jupiter. On the other hand, forming small planets like the Earth apparently doesn’t take much because even stars with a tenth the Sun’s metals host them. Which all sort of makes sense. But these results don’t answer everything. Why, for example, aren’t the stars with really big metallicities (the blue dots near the top left of the figure) always able to form big, Jupiter-like planets? This cluster of three blue dots are all members of the KOI-3083 planet system, whose star is Sun-sized but has almost three times more metals, but all the planets are smaller than Earth. Could there be big planets in that system we haven’t found yet? Or maybe the planet formation process involves so much randomness (stochasticity) that a big metallicity only steers the system in the direction of big planets; it doesn’t force them in that direction. Like gently shepherding a toddler through a toy store – more often than not, you’ll end up with toys in your cart.